Ms. Rahat Hossain is working to create racial equity on Long Island by supporting ERASE Racism, a civil rights non-profit organization that works to eliminate racial disparities across Long Island and the region. Ms. Rahat Hossain is helping to create racial equity on Long Island by supporting ERASE Racism, a civil rights non-profit organization that works to eliminate racial disparities across Long Island and the region. The funds raised from its Annual Benefit, to be held Wednesday, June 8th at the Garden City Hotel, support the organization’s research, education, legal action and public policy advocacy campaigns to promote racial equity in housing, public school education, and public health. While this is Ms. Hossain’s first year serving on ERASE Racism’s Annual Benefit Committee, she and her family have a long history of civic engagement and philanthropy. 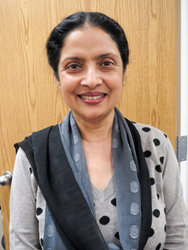 Ms. Hossain is committed to causes in which she can “make a difference in a small way.” She and her husband, Zaki Hossain, established the Zaki Hossain Center for Hypertension, Diabetes and Vascular Disease at Nassau University Medical Center. They also created a scholarship for the valedictorians of Hicksville High School and East Meadow High School. In 2010, Mr. Hossain was presented with the President’s Philanthropic Award from the Dr. Martin Luther King, Jr. Birthday Celebration Committee of Nassau County for sponsoring a school essay competition on Dr. King. A native of Bangladesh, Ms. Hossain plans an annual Bangladeshi American cultural night at Eisenhower Park. The ERASE Racism 2016 Benefit will honor Dr. William H. Johnson, Rockville Centre Superintendent of Schools, known nationally as an innovative expert in closing the achievement gap for poor and minority students, and Mr. Kevyn D. Orr, Partner-in-Charge at international law firm, Jones Day, for his groundbreaking success in bringing the historic, primarily African American city of Detroit back from the edge of financial collapse. ERASE Racism also will be presenting its 2016 Leadership Award to the National Center for Suburban Studies at Hofstra University for spotlighting the effect of racial disparities on Long Island. For more information and to buy tickets, visit http://www.eraseracismny.org or call 516-921-4863. About ERASE Racism: ERASE Racism is a regional organization that leads public policy advocacy campaigns and related programmatic initiatives to promote racial equity in areas such as housing, public school education and healthcare. It engages in a variety of research, education and consulting activities to identify and address institutional and structural racism, primarily on Long Island.